One of the famous player of Pakistan Shahid Afridi having a good point about the success of the match which was held some months before between Pakistan and India. 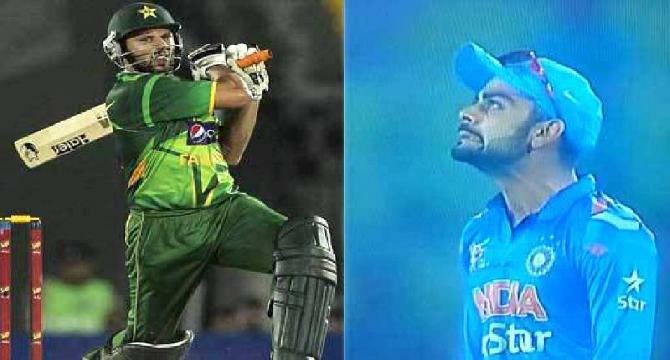 This was one of the match of Asia Cup held between Pakistan and India. Remember in this match of Asia Cup Pakistan needs 10 runs in last 5 balls to win against India. Nine players of the Pakistan were out. At this moment Junaid Khan took a single to let play Shahid Afridi. Eshwant is bowling on the other hand. Shahid Afridi by hitting two sixes on the two balls of Eshwant made stunned not only the crowd but also the critics. On this historic sixes Shahid Afridi said i had a belief about 80 to 85 % that will ball go out of the boundary but was not sure about 100 %. About this Shahid Afridi said it looks like Allah gave order to angels to throw this ball out of the boundary. At this historic match Shahid Afridi played a historic innings of 34 runs on just 18 balls. Nice post I like it and commented on it. I expect that you will also like and comment on my posts.